Southwards through the southwest coast of Hudson Bay and the southern coasts of James Bay. More than half of the migrating red knots pass through Delaware Bay during the spring, making it a crucial stopping point. The red knot breeds in dry tundra areas, such as sparsely vegetated hillsides. When not breeding, it is found primarily in marine habitats, coastal inlets, estuaries and bays. The species’ diet varies according to the season. During breeding, it eats plants, arthropods and larvae. During migration, it feeds on hard-shelled molluscs. In Delaware Bay, it gorges on horseshoe crab eggs. 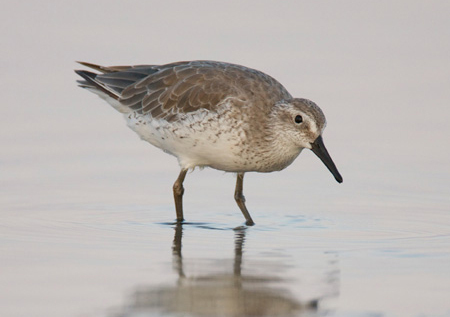 When the red knot isn’t breeding, it is a brown colour. However, when breeding season comes along, the species becomes one of the most colourful shorebirds, turning a bright russet on its head and chest. BirdLife International and NatureServe (2014) Bird Species Distribution Maps of the World. 2014. The IUCN Red List of Threatened Species. Version 2014.3. iucnredlist.org. Downloaded on 28 November 2014. Range data for Arctic regions augmented from COSEWIC Assessment and Status Report on the Red Knot (*Calidris canutus*) in Canada. COSEWIC, 2007.